Abstract: A continuous peripheral nerve block is type of pain management that involves the insertion of a catheter near the surgical site which, will be connected to an infusion pump that will infuse local anesthetics for site specific pain control. The catheter can then be connected to a portable pump which will allow a patient to experience the post-operative effects of the local anesthetic from the convenience of their home. This will result in a shorter hospital stay, and a faster, mobile and comfortable recovery. Documented benefits appear to be dependent on successfully improving analgesia, and include decreasing baseline, dynamic pain, supplemental analgesic requirements, opioid-related side effects, and sleep disturbances (Ilfeld, 2011). Currently, the standard treatment of post-operational care includes, nerve blocks (non-continuous), IV Opioids, Oral Opioids, and pain patches. 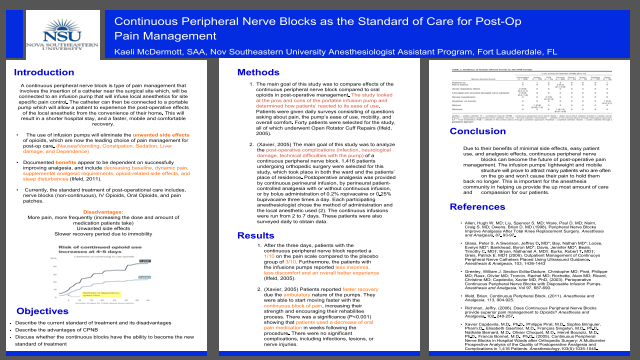 Due to their benefits of minimal side effects, easy patient use, and analgesic effects, continuous peripheral nerve blocks can become the future of post-operative pain management. The infusion pumps’ lightweight and mobile structure will prove to attract many patients who are often on the go and won’t cause their pain to hold them back no longer. This is important for the anesthesia community in helping us provide the up most amount of care and compassion for our patients. Allen, Hugh W. MD; Liu, Spencer S. MD; Ware, Paul D. MD; Nairn, Craig S. MD; Owens, Brian D. MD (1998). Peripheral Nerve Blocks Improve Analgesia After Total Knee Replacement Surgery. Anesthesia and Analgesia, 87, 93-97. Greeley, William J. Section EditorDadure, Christophe MD; Pirat, Philippe MD; Raux, Olivier MD; Troncin, Rachel MD; Rochette, Alain MD; Ricard, Christine MD; Capdevila, Xavier MD, PhD, (2003). Perioperative Continuous Peripheral Nerve Blocks with Disposable Infusion Pumps. Anesthesia and Analgesia, Vol 97, 687-690. .